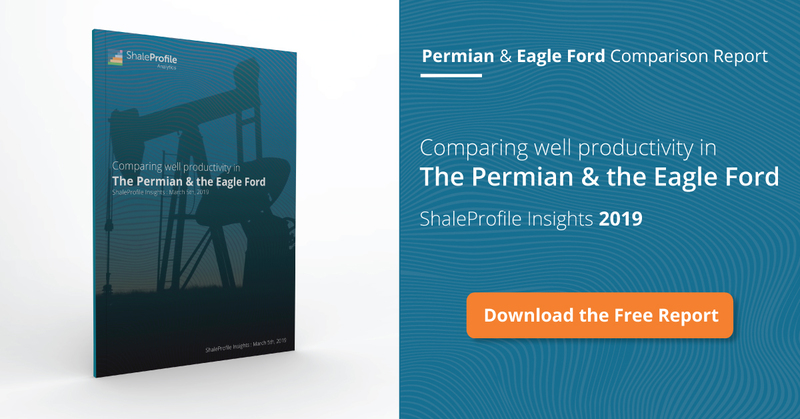 This presentation contains the latest oil production data from 10547 horizontal wells in the Eagle Ford, until February, supplied by the Texas RRC. Well productivity in the Eagle Ford seems to have increased in the 2nd half of 2015, as we’ve seen in the Bakken as well. But don’t read too much yet in the 2nd data point of the 2015 vintage in the well quality tab, as that only contains the data for 1 month (the wells that started in January). I found it striking to see how closely the production profiles in the Eagle Ford seem to follow an exponential decline; you can see this most clearly in the “Well quality” tab, by switching to logarithmic mode. This shows that the average Eagle Ford well is on a path to about 20 bo/d by year 5. Not all data is reported yet for recent months. This is visible in the “Well status” tab, as the total number of wells in February is dropping compared with January. This is not due to survival bias, as I correct for that by adding 0 production for shut-in wells. I estimate that the total production in February shown here may still be revised upwards by around 10% (and less so for earlier months). I’ll try to improve this estimate in the future. Sometimes it happens that a well is bought by another operator. For these cases I now added a distinction between the operator that produced a well for a certain month in the past (“actual operator”), and the operator that, according to the latest information, owns the well (“current operator”). In the total production overview, I show the production according to the “actual operator”, while on the “well quality” tab, I show the production based on the operator that now owns the well (“current operator”). In the past I used the “actual operator” for both views. Not shown here, but from the data I can see that the total Gas to Oil ratio for these wells is 2.0 in 2016 so far. Wells in gas leases are excluded, and thus also condensate production, although I will attempt to include these in the next update. I will have a post on Montana on Friday, followed by a post on the Permian during the weekend. Enno, I continue to marvel at the amount of data you have gathered and the friendly manner in which you have presented it. Thank you. Please correct me, not if, but when I am wrong: the increase in well productivity in 2o15 is likely a function of saturation drilling in proven sweet spots, fewer wells being drilled overall and less “dilution” in overall productivity from poorer wells. So I am inclined to believe an increase in well productivity is simply high-grading at it’s best. However, in my field observations I am also aware that a concentrated effort is being made in steering laterals within a certain zone of interest (for instance containing higher carbonate content with higher “brittleness” factors , more selective perforating in that zone of interest, more stages and more frac sand. All this I attribute to fewer wells, less chaos and more time to pay attention to details. As you point out, however, we will have to see how these wells perform in the near short term to know if this matters in the long term. I am astounded at how poor the realized production from Eagle Ford wells actually is relative to reported EUR’s. Thanks again, Enno. > the increase in well productivity in 2o15 is likely a function of saturation drilling in proven sweet spots, fewer wells being drilled overall and less “dilution” in overall productivity from poorer wells. So far the data shows that 1032 horizontal wells started production in oil leases in the EF in the first half of 2015, vs 647 wells in the 2nd half. This represents a 37% decline (although these numbers may still be somewhat revised upwards). By focusing on the best prospects, you would indeed expect an uptick in productivity from this pretty big drop in completions. Also, if these wells follow similar profiles as earlier wells, the main gain may have been in the first year of production, of about 10 kbo on average (you can see this by grouping by “quarter of first flow” in the well productivity tab). This gain is significant when you compare it with the average return in the first year of about 100 kbo (so about a 10% improvement), but becomes less so when you compare it to the 5 year expected return of these wells of, I guess, somewhere around double this amount (so about a 5% improvement). This guess is based on extrapolating the well profiles, based on past well performance; of course it’s too early to say for sure what these wells do by year 5. So indeed, I think we see the effect of high-grading here. Another effect that I suspect we may be seeing here (without having proof for it – although it should be possible to verify this), is that there has been a trend to larger fracs, as service companies have been dropping costs for the required materials for these after the collapse in demand. As Ciaran Nolan has pointed out, completion techniques seem to have an impact mainly on the first year performance. I think we are early to make a general judgment on completion technique improvements affecting first year disproportionately. It may very well be true, but I rest more in a middle ground. Have not seen strong synthesized proof of this. Also, the impact in the EF may not be same as in other plays that have inherently lower decline (e.g. Bakken). One thing that is interesting is the increase in drilling efficiency (spuds/rig/month). This may also be an impact of high grading (tighter areas), but could also come from being able to plan better or from just keeping the better crews. I now have data on the shale oil production in Montana. Although total production there isn’t as large as the other covered areas, I think it holds some very interesting leasons. I will have a post on this on Friday, followed by a post on the Permian during the weekend (I need a bit more time for the data). Sounds great. Elm Coulee is the longest lived LTO play. Insights for decline and for downspacing limits and price responses. Sort of the Barnett of oil. Thanks for all the info. Does anyone know if it is possible to find basin specific production forecasts for the Eagle Ford, Permian and Bakken?